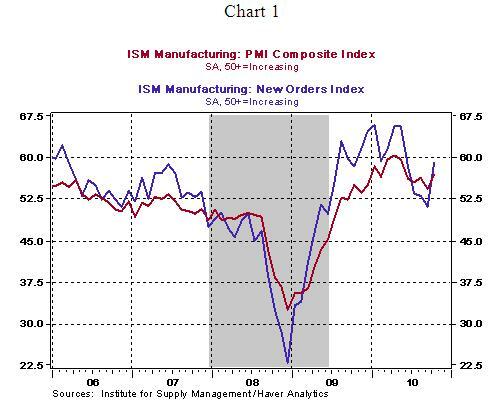 The ISM composite index of the manufacturing sector rose to 56.9 in October, the highest since May 2010. The headline and details indicate that the factory sector is back on its feet after a sluggish performance in the third quarter. The index tracking new orders, a forward looking indicator, increased to 58.9 in October vs. 51.1 in the prior month. 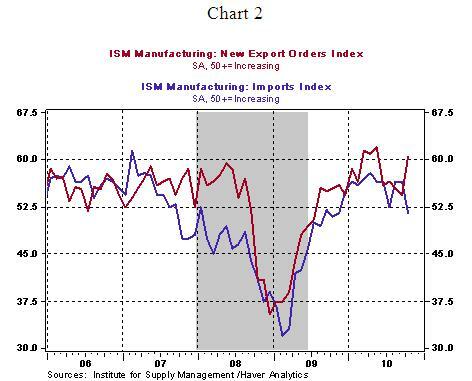 The exports orders index also posted a strong increase of six points to 60.5 in October. The import index fell to 51.5 from 56.5 in September. If the export index continues to advance in the months ahead, it would be consistent with expectations of a positive contribution to real GDP growth. The index tracking prices has risen from 57.0 in May to 71.0 in October, largely a reflection of higher commodity prices. Respondents indicated that a weak dollar has resulted in higher prices of commodities and reduction of margins. This concern has another aspect to bear in mind because exporters are likely to gain from a weak dollar. The overall tone of the report is positive because in addition to an increase in indexes of new orders and exports, indexes tracking production and employment also advanced (see table below) during October. Personal income fell 0.1% in September after a 0.4% gain in the prior month, while wages and salaries held steady. Real consumer spending grew only 0.1% in September following a 0.3% gain in the prior month. 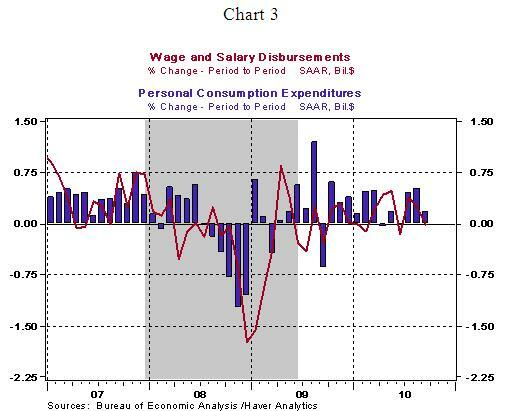 The tepid readings of consumer spending and income are consistent with the third quarter headline GDP. Going forward, robust hiring holds the key to stronger growth in consumer spending. The saving rate of the U.S. economy edged down to 5.3% in September vs. 5.6% in the prior month. In the first nine months of the year, the saving rate averaged 5.6% vs. 6.1% in the same period during 2009. The personal consumption expenditure price index barely budged in September (+0.08%), putting the year to year increase at 1.36%. The core personal consumption expenditure price index, which excludes food and energy, held steady (+0.04%) during September, with the year-to-year gain at 1.36%. 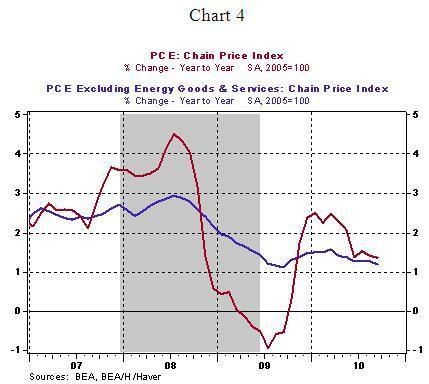 These readings are below the Fed's preference of inflation data. The Fed's policy statement on November 4 should spell out the details of the much anticipated second round of quantitative easing.